Our Paladin K9 Executive Protection Dogs are intended for clients who demand the highest level of protection. Paladin protection dogs provide protection from the most extreme threats. We recognize such threats present a relatively low level of everyday risk, but with a Paladin protection dog, you’ll always be protected. Most of our clients enjoy living within very safe homes. While they demand the utmost in protection, they also want to feel confident that their extraordinary dog will behave properly in everyday life. We guarantee that your Paladin protection dog will be the perfect addition to your family. By working with select breeds and training them from their earliest days of life, we are able to provide dogs with the friendly, loving personality of Golden Retrievers or Labradors. Your dog will seeing everyone as a best friend unless told otherwise. A simple spoken command releases the dog and provides instant protection for your family. We don’t want to just sell you a dog. We want to provide you a new member of your family. Your new canine family member will be a loyal, reliable, provider of instant protection. This protection comes is released as quickly as you can speak a command. This protection is released as quickly as you can speak a command. But, because of the Paladin training, your dogs can snuggle and play with your children, travel with you in your vehicle, and be by your side every day. Contact Paladin K9 today to see how we can provide you with the perfect protection dog. Let us match you with the perfect dog! Fill out our questionnaire and we will match a trained protection dog with your lifestyle. Would you let your child sleep with a loaded pistol? Would you allow your child to play quietly on the floor with an assault rifle? Of course not. With an Executive Protection Dog, you can provide the same level of security and safety while allowing your children to enjoy the comfort and “huggable protection” provided by a highly trained Paladin protection dog. Often, we tell our clients that bullets can’t be recalled. Pistols can’t shoot around corners or find their targets in the dark. With a protection dog, you can release a defensive weapon against an attacker with a single spoken command. You don’t need a license to brandish a protection dog in public either. And, you don’t have to worry about government rules or restrictions outlawing dogs. Your dog immediately runs to your side. Your dog analyses the threat and places itself between you and the attacker. Now “engaged,” your dog shows aggression to to the attacker. Unless released by your verbal command, your dog remains by your side, between you and the attacker. As you move, your dog stays with you, circling you in a defensive stance without you needing to hold its leash. Your dog positions itself between you and the threat, in a “ready state,” waiting for you to give the release command to defend you from the attacker. 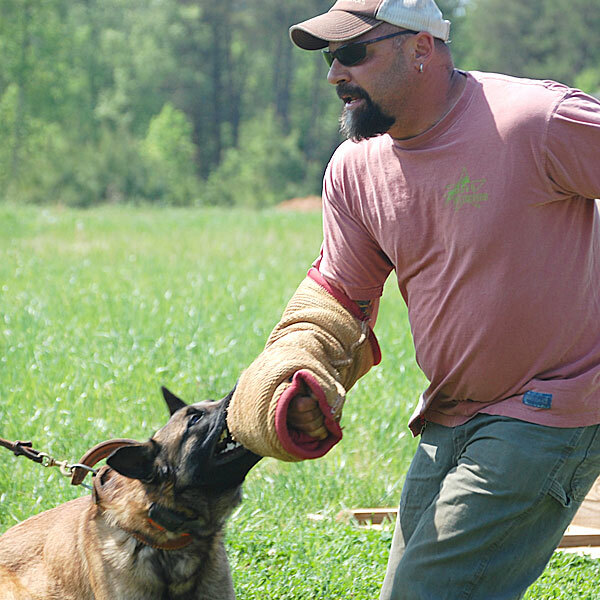 Master Dog Trainer, Andy Hanellin, works with a protection dog on the training field. Your Executive Protection Dog will remain by your side, barking without biting, unless you’re approached by the attacker or you instruct the dog to attack. This means you can focus on what’s most important: getting yourself and family into the safest possible place. Meanwhile, your dog’s focus is on protecting you. Even when you’re picking up the children to go into the house or bedroom, or where ever your safe place happens to be, your dog will remain by your side, engaged, showing constant aggression, positioned between you and the threat, even if it requires doing so while walking backward. Andy Hanellin of Paladin K9 Executive Protection Dogs has been the trusted dog trainer for NASCAR® legend Michael Waltrip and his family for nearly a decade. Consequently, Michael Waltrip ensures his daughter’s safety with a protection dog from Paladin K9. Retired Professional Football Player, Ryan Kalil, talks about choosing Paladin K9 for his family protection dog. A home invasion could happen as you are getting out of your car or answering the door, or could take the form of a forced entry while you’re watching TV, or unfold as an assault in a parking lot. Most happen from a distance of about 15 feet. It takes almost 2 seconds for an attacker to cover that distance. What if a home invasion takes place? In that moment it is not a matter of your degree of risk, or how removed your community is from crime. In that moment you will want the highest caliber of dog with the most advanced fighting skills combined with the advanced protection skills to ensure your family is secure. If someone is profiling homes in your neighborhood and sees a dog that could be a threat, he will choose another home. What if they don’t see your dog? Once inside, armed and probably under the influence of some narcotic, most of the criminals that commit these crimes will be committed to see it through. 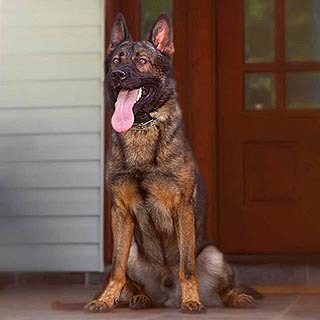 Paladin K9 offers the finest and most reliable protection trained dogs in the marketplace. We have pups available to train for you locally or we can locate the perfect dog for you and your family. Paladin K9 has a wide network of breeders in the United States and Europe which allows us to find the best dog to fit your specific needs.